Multiple plots is what makes a novel a novel. This is true to a certain degree for mathematical graphs as well. Graphs can be fine with just one plot, but it is often necessary to show more than one plot in one graph or in various subgraphs in one image. We have given so far lots of examples for plotting graphs in the previous chapters of our Python tutorial on Matplotlib. A frequently asked question is how to have multiple plots in one graph? In the simplest case this might mean, that you have one curve and you want another curve printed over it. This is not a problem, because it will be enough to put the two plots in your scripts, as we have seen before. The more interesting case is, if you want two plots in one window. In one window means that they should be in two separate sublots, i.e. not printed on top of each other. The idea is to have more than one graph in one window and each graph appears in its own subplot. We think that the gridspec is the best option, because it is a lot easier to use, if the layout has to be more complex! If a subplot is applied to a figure, the figure will be notionally split into 'nrows' * 'ncols' sub-axes. The parameter 'plot_number' identifies the subplot that the function call has to create. 'plot_number' can range from 1 to a maximum of 'nrows' * 'ncols'. If the values of the three parameters are less than 10, the function subplot can be called with one int parameter, where the hundreds represent 'nrows', the tens represent 'ncols' and the units represent 'plot_number'. This means: Instead of subplot(2, 3, 4) we can write subplot(234). Even though the previous approach is acceptable, it is stylistically more appropriate to use an object oriented approach by using instances of the Figure class. We demonstrate this by rewriting the previous example. IN this case, we have to apply the "add_subplot" method to the Figure object. Let us get rid of the ticks again. This time we cannot use plt.xticks(()) and plt.yticks(()). We have to use the set_xticks(()) and set_yticks(()) methods instead. 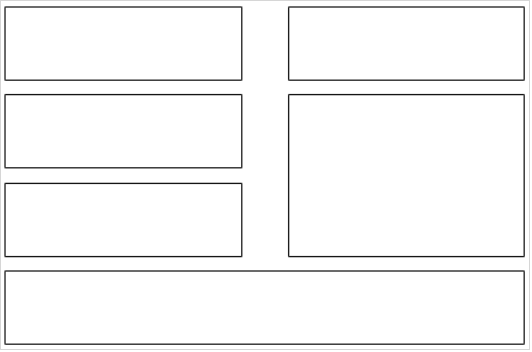 How can you create a subplotdesign of a 3x2 design, where the complete first column is spanned? 'matplotlib.gridspec' contains a class GridSpec. It can be used as an alternative to subplot to specify the geometry of the subplots to be created. The basic idea behind GridSpec is a 'grid'. A grid is set up with a number of rows and columns. We have to define after this, how much of the grid a subplot should span. Matplotlib is programmed and designed -- like Python itself -- in a completely object oriented way. The examples which we have given so far have been very simple, and to keep them as simple as possible, we haven't worked with figure objects for example. Though the objects where automatically created anyway. The advantage of this approach emanate when more than one figure will be used, or when a figure consists of more than one subplot. 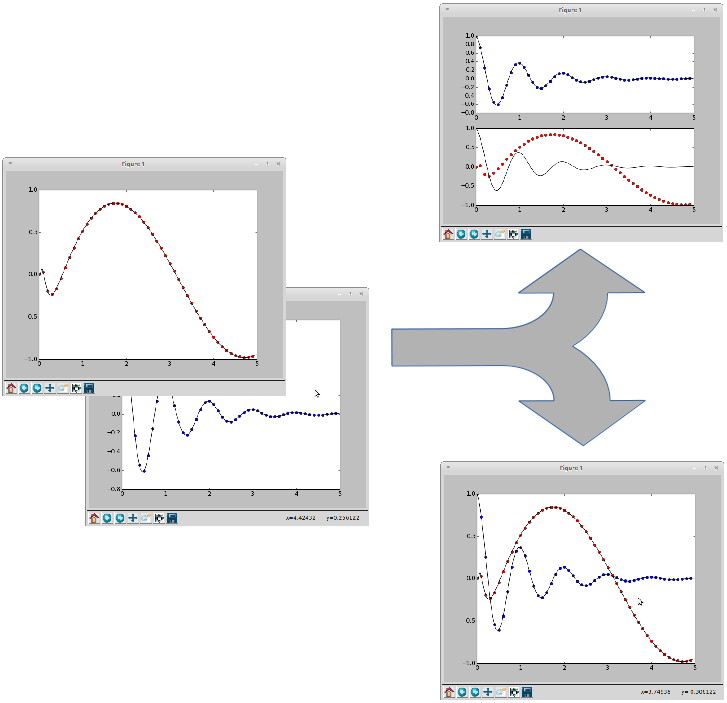 The following topics are not directly related to subplotting, but we want to present them to round up the introduction into the basic possibilities of matplotlib. The first one shows how to define grid lines and the second one is quite important. It is about saving plots in image files. Output can be generated in the formats PNG, JPG, EPS, SVG, PGF and PDF.